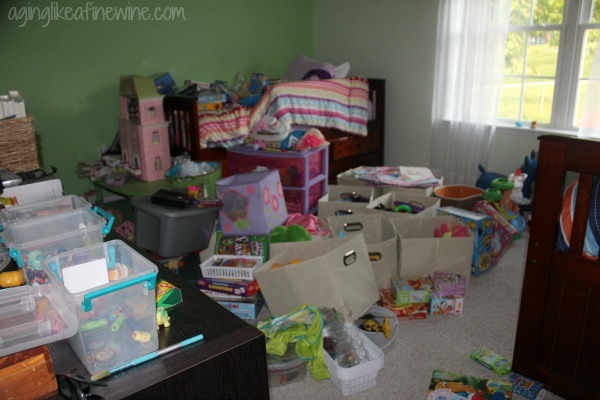 When decorating their room, I needed more space for storing toys, books, and games. Paul, who is great at building things, removed the door from the closet and built shelves with cubbies attached to one wall. This works out very nicely. I purchased the colorful rolling carts you see here at Sams Club, but they are also available at Amazon. The drawers are full of craft supplies! 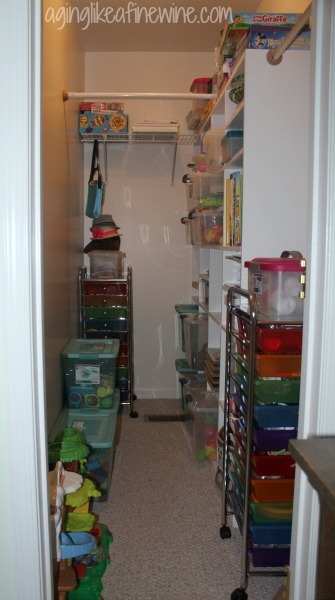 In the closet, we have games, craft supplies, and more toys. I love to keep toys organized in plastic tubs and use them whenever they’ll work. 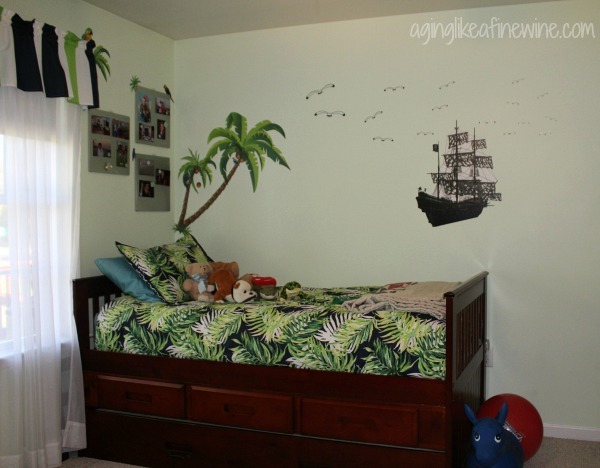 Wall decals are great for kids rooms. They can easily be changed to accommodate a growing child. I originally had cute little owls and other forest animals on the walls, but when I asked my 7-year-old granddaughter if it was too babyish and her reply was “yes”, I knew it was time for a change. The entire room was also overdue for a good cleaning and getting rid of things. I started by taking everything off the walls and out of the closet. Can you believe this mess! I work best that way on big cleaning projects; just get it all out in the open and start reorganizing. 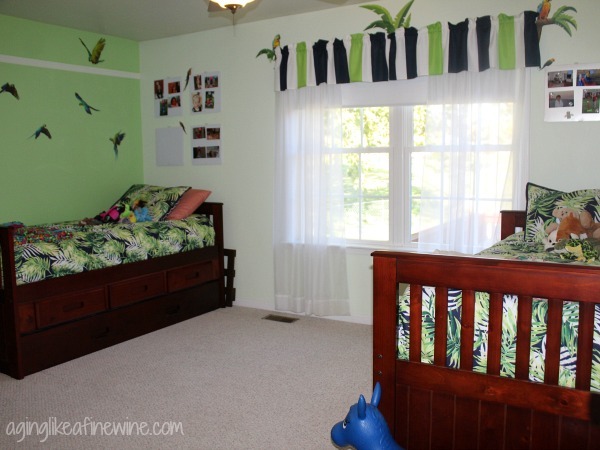 For this room redecorating project, my granddaughter requested a tropical theme with lots of parrots, so that’s what I did. I ordered all of my wall decals from Amazon and also found the bedspreads on Amazon. I loved the green palm fronds on these with the navy background. I am so happy with them, I think they’re the perfect look. The window coverings consist of a room darkening blind purchased at Lowes, a valance once again found on Amazon and simple white inexpensive sheer curtains. The colors in the valance just match the green and navy in the bedspreads and the stripe adds the perfect contrast. I wanted to put pictures of all of the grandkids up and to be able to change them out easily. I found the magnetic boards over the head of each bed at Walmart for $7 each and so far they’re working perfectly. The beds are twin size with three drawers for clothes, plus a pull-out trundle underneath, giving us a total of 4 beds for the grandchildren. Consequently, when they spend the night, grandma always camps out in one of the beds! These have really worked out well for us. 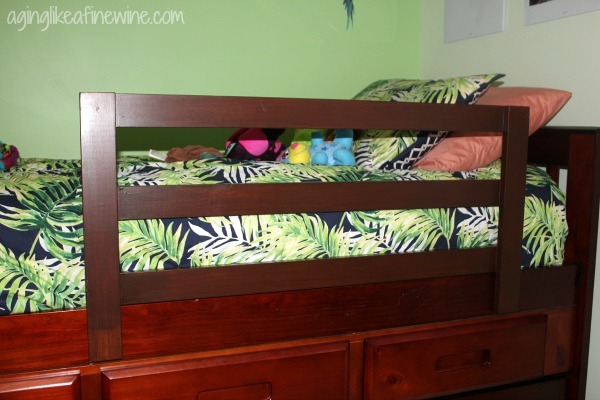 Because of the trundle underneath and the drawers, the bed is rather high, so Paul made these easy on, easy off rails to keep the kids from falling off. Next the really fun part! We have an “artist” wall! It was important to me that I have art here from each of my grandkids so before I went to California over the summer, I had some canvases sent from Amazon to my grandchildren there. It worked great, they painted them and I brought them home in my suitcase! I purchased canvases from Michaels for the grandchildren that live close by and let them paint whatever they wanted on them. Now they adorn our artist wall, along with 6 clipboards, one for each child so they can hang their other artistic endeavors. The final piece to this wall is the “artsy wreath” I made as part of the Crafty Destash Challenge in September. I love this wall. For additional toy organization, I used this cubicle shelving unit. Each tote is full of toys; cars, trucks, stuffed animals, and various other things. Last, but not least, is a very special unfinished project. I found this old book cart at a thrift store for $20 and fell in love with it. My plan is to paint it. I did get it washed and cleaned up but haven’t gotten around to painting it yet. Sometimes that’s the way things roll around here. For a project to go from thought to action can take a while! Thanks so much for stopping by and reading. 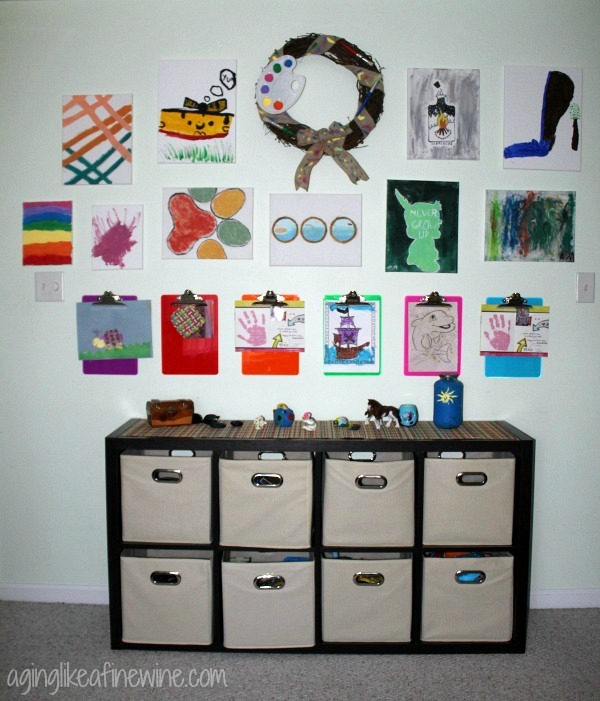 I hope you were able to come away with an idea or two for your kids or grandkids room! 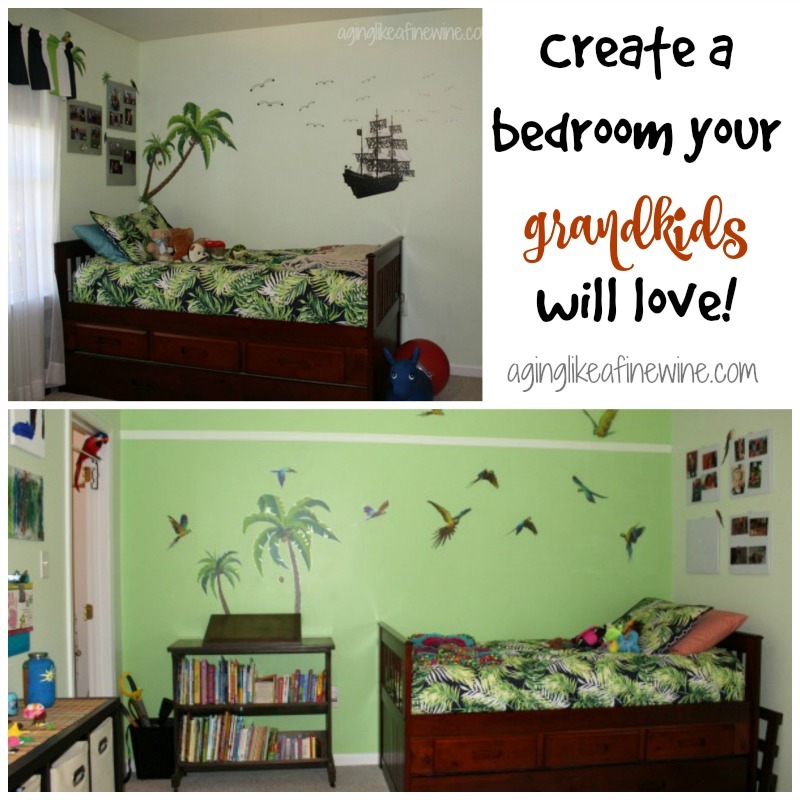 What a gorgeous room (I’m wishing I was one of your grandchildren and I hope they realize how lucky they are!) 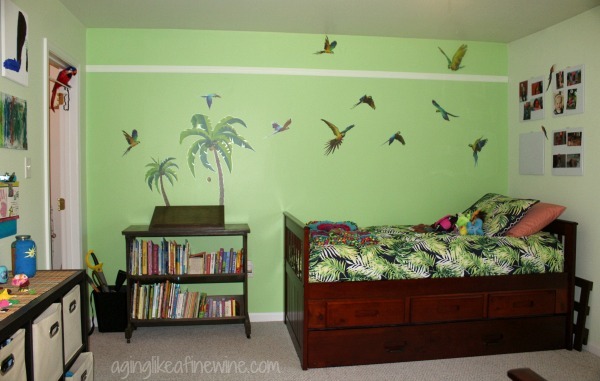 I particularly love th palm trees and parrots – a perfect touch for finishing off the room. Thank you Leanne! The kids do like the room and they definitely know it’s theirs. After I get a hello kiss and hug, they head straight to their room and start pulling things out. And they always beg to spend the night. Aren’t grandkids great! Thanks so much for stopping by! Love it, what a nice place you created! I’m so thankful to have a house large enough that my grandbabies have their own rooms when they come to visit. Thank you Teresa for linking up and co-hosting at the #BloggingGrandmothersLinkParty. 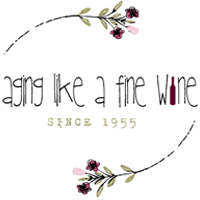 I shared your post on Fb, Pin, and Tw. Thank you Dee and thanks so much for sharing! This is delightful! What a way to make the kids know they are always welcome! I love the wall of art and the organized closet. I agree with you that empty nest bedrooms are a blank canvas of fun for this purpose. Part of one of ours is a family library. Kids are welcome to stop by any time and check out a book. 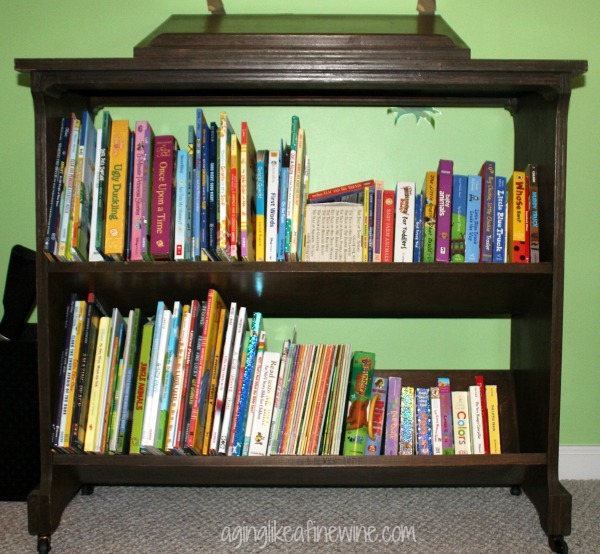 Hi Joyce, I love the family library idea. Thank you so much for stopping by and for your sweet comment!